A household in Dentrix Ascend is a group of patients with the same primary contact person. You can create patient records, at one time, for members of a household. When you create a household, all members of that household are assigned the same specified primary contact person by default (you can change the primary contact for a patient at a later time as needed). Looking up a patient's record. Navigate to a day or week. 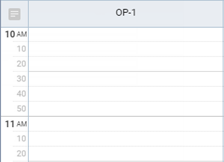 When you cannot find a patient's record from the main Patient Search field, click (or tap) the Create new household option on the results list. This option is available only when what you have typed in the search box narrows the results list enough. If none of the household members have patient records, you can create a household. If some but not all of the household members have records, you can re-create the household, adding the additional household members and making sure that all household members have the same address, primary contact, and primary guarantor. However, if you do not want to re-create a household, you can add patient records individually for the household members that do not have records later (ignore the steps that follow). When you are attempting to schedule an appointment, from the results list of the Patient Search box on the Appointment Information panel, click (or tap) Create new household. This option is available only when what you have typed in the search box narrows the results list enough. If none of the household members have patient records, you can create a household. If some but not all of the household members have records, you can re-create the household, adding the additional household members and making sure that all household members have the same address, primary contact, and primary guarantor. However, if you do not want to re-create a household, you can schedule new-patient appointments individually for the household members that do not have records and then edit their patient records later (ignore the steps that follow). The Create new household dialog box appears. Enter the first household member's name (first, last, and middle initial), gender, birth date, and preferred name (if applicable). 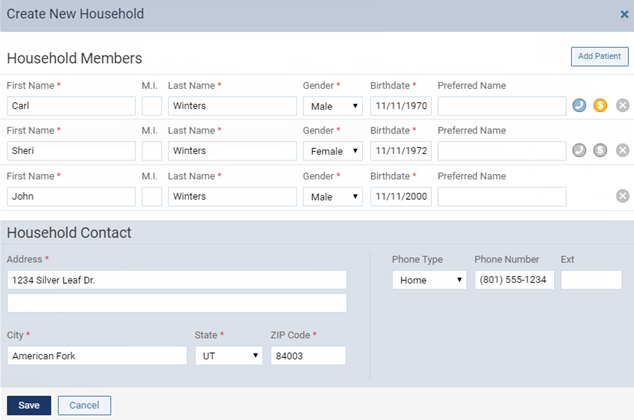 For each additional household member that you want to add, click (or tap) Add Patient, and then enter that household member's name (first, last, and middle initial), gender, birth date, and preferred name (if applicable). The first adult you enter for the household is assigned as the primary contact and primary guarantor by default. However, you can specify a different household member to be the primary contact and primary guarantor or specify one household member to be the primary contact and another to be the primary guarantor. To change the primary contact person, click (or tap) a Primary Contact icon to assign the corresponding patient as the primary contact. To change the primary guarantor, click (or tap) a Primary Guarantor icon to assign the corresponding patient as the primary guarantor. The corresponding icons change from gray scale to color to indicate which patient or patients are selected as the primary contact and primary guarantor . Minors cannot be primary contacts or guarantors. Note: If any of the household members listed already have patient records, when you save the household, the primary contact person, primary guarantor, address, and primary phone number in those patients' records will be updated accordingly. If a patient listed should have a different primary contact person, primary guarantor, address, and/or primary phone number than the other household members, remove that person from the list by clicking (or tapping) the corresponding Remove icon . Under Household Contact, enter the address and a phone number for the specified primary contact person for the household. Note: Patient records with minimal information are created for the patients. 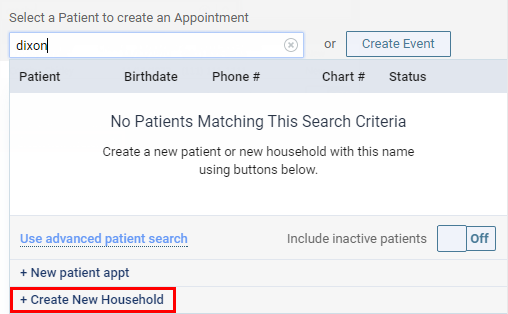 If you were attempting to schedule an appointment when you decided to add the new household, you can now schedule the appointment, as you would for an existing patient, for one of the patients in the new household.